The humanitarian crisis enveloping Haiti is the largest natural disaster since the Tsunami in Southeast Asia 5 years ago. The fears in the first responder community are that this disaster could rival the massive Chinese quake that killed more than 240,000 in 1976. If the spirit moves you to help, these are the organizations equipped to do it. Finally, the FBI urges people who are looking for ways to help with earthquake relief to be wary of solicitations that could be from scam artists. Ignore unsolicited e-mails, and do not click on links within those messages. Be skeptical of individuals representing themselves as surviving victims or officials asking for donations via e-mail or social networking sites. Be cautious of e-mails that claim to show pictures of the disaster areas in attached files, because the files may contain computer viruses. Open attachments only from know senders. Decline to give personal or financial information to anyone who solicits contributions. Make contributions directly to known organizations, rather than relying on others who claim in e-mails that they will channel the donation to established groups. Thanks for posting all the aid links, SB. 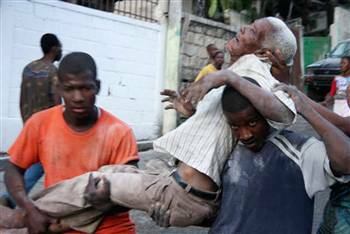 May God bless the people of Haiti.